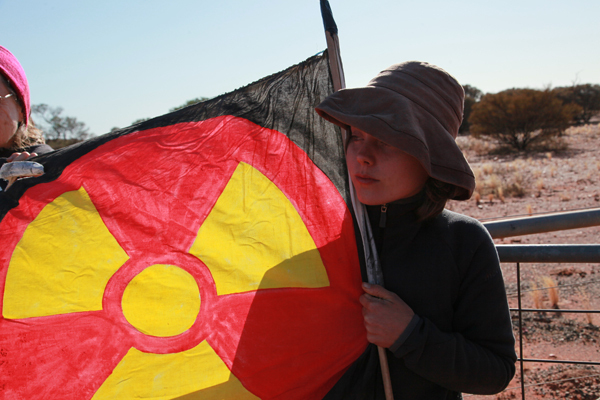 The Western Australian Nuclear Free Alliance (WANFA), made up of Aboriginal Traditional Land Owners who are concerned about uranium mining on their country, from the Pilbara, the Kimberley, the Goldfields, the Great Victorian Desert, the Central Desert, the Gascoyne, Perth and the South West and their allies. 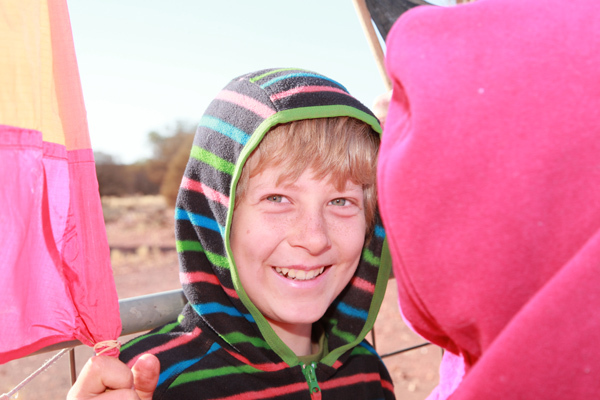 WANFA met from 15th-16th of September at Kutunatu Ngurra camp just outside of Leonora. 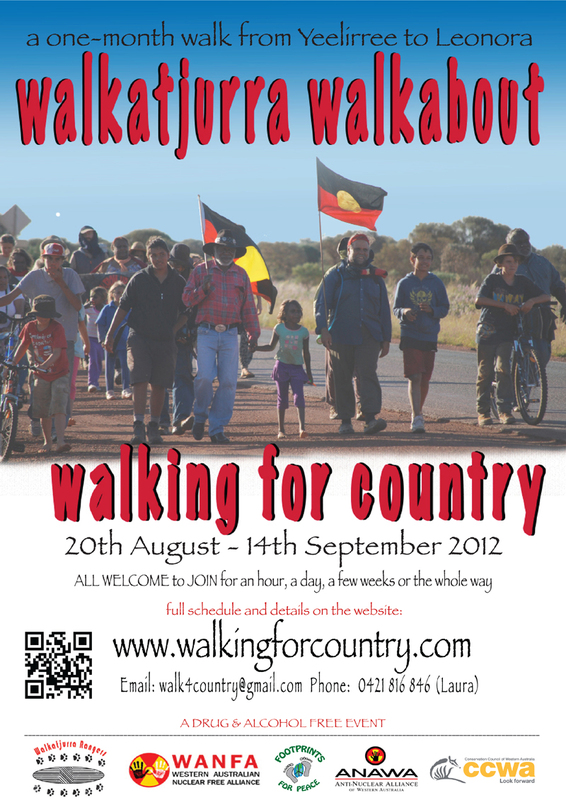 The Walkatjurra Walkabout started at Yeelirrie on the 24th August, led by Traditional Owner, Kado Muir. 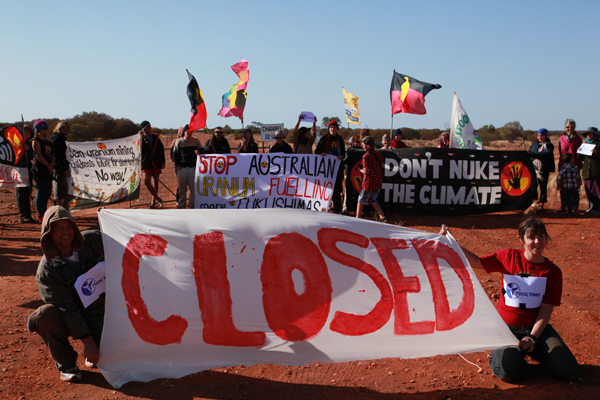 Days after leaving Yeelirrie, BHP Billiton announced that they had sold their uranium project to Canadian company, Cameco. Reflection word for today is family and lo and behold it’s Fathers’ Day here in Oz, unbeknown to the person who suggested this word for us to meditate and reflect on! Yep lots of phone calls home from Agnew before we got out of range. People are contemplating their lovely friends and family who are going through challenges and ill health and we are sending them all love. Of course we are here with the Wongai family who have in their big heart introduced us to their families, some their customs, language, bush tucker and dreaming stories. 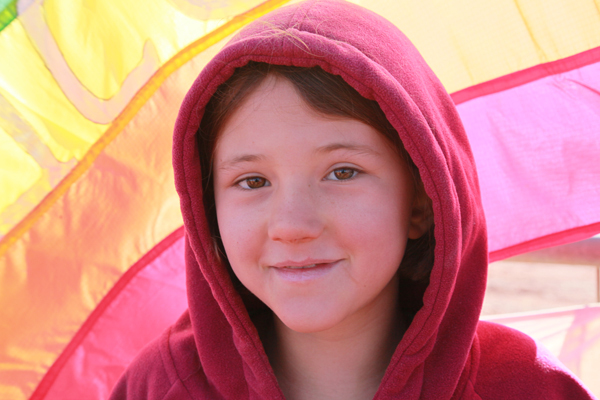 We share their aspirations to protect their country and joint responsibility for the planet. Today we walked sixteen kilometres through Ant Dreaming country led by lead Walkatjurra Head Ranger, Gudathada (Zach), and Nathan, proudly carrying the Aboriginal flag. We walked along a beautiful red dirt road through land which overlaps with the other songlines of the Seven Sisters, Carpet Snake and Dragonfly. Our thought-for-the-day yesterday was ‘bearing witness”. Many of us have joined this walk to get a better sense of the land out here, the people that will be directly affected by these mines if they are allowed to go ahead. So often mines and their ramifications like toxic waste piles, poisoned water and constant pressure from mining companies are things happen so far away from our lived experience. Far away from our day-to-day lives in metropolitan areas. Well, we got some good news, and some not-so-good news. The not-so-good news is that yesterday a Canadian company, Cameco, bought the Yeelirrie mining lease from BHP Billiton for $430 million. Quite a price to pay if they have no intention of developing it. Yeelirrie is the largest known uranium deposit in WA. At our morning circle today we began with a reflection about mindfulness. This walk is in some ways a pilgrimage, and so each day we will be carrying a thought with us, to reflect upon in our conversations, walking, or quiet space we can find during the day. So far we have focused on “gratitude” and “hope” – core words which have provoked many considerations from different people in the group. Day one started at Yileerrie with a spectacular desert sunrise, helped along by light cloud cover that we would learn to be very thankful for once we started to walk. With camp packed and breakfast had, we formed a circle and shared names, a thought for the day, hugs and a happy 8th birthday to one of the youngest walkers. And we were off, flags held high in the air and the Aboriginal flag setting the pace up front. Our mob of 30 something looked pretty good, wrapped in colour, of all ages and phases, escorted by three dogs and two camels, walking on the red sand. Its only just after lunch here right now, everyone is settling in for the day at Yeerlirrie, and we have already achieved so much. 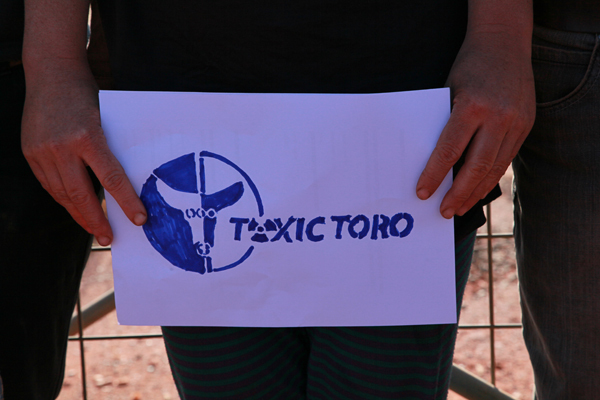 We got up at 6am for an early morning media photo opportunity outside the entrance to Lake Way, site of toxic Toro’s proposed uranium mine, just a few kilometres up the road from Wiluna. We made a bit of spectacle of ourselves, chanting, waving flags, holding our banners and putting a big CLOSED sign across the gate. The ‘Walkatjurra Walkabout’ mob is a diverse community of about 45 people currently, which includes 6 kids (who are very excited to be here!) and 3 dogs. We are busy learning how to build and pack up camp everyday, and share skills that will enable us to support each other in our mobile community for the next three and a half weeks.